On his way to Augusta to file forms for incorporation, Brett Settle was still thinking about what to name his Bangor steakhouse when the Jimmy Buffett track “Brahma Fear” popped into his head. “Brahma is a cow,” he said aloud. Buffett’s lyrics have nothing to do with livestock, but Settle was right: The Brahma, or Brahman, is a popular breed of beef cattle. It’s also, he decided, a fine name for a grillroom. 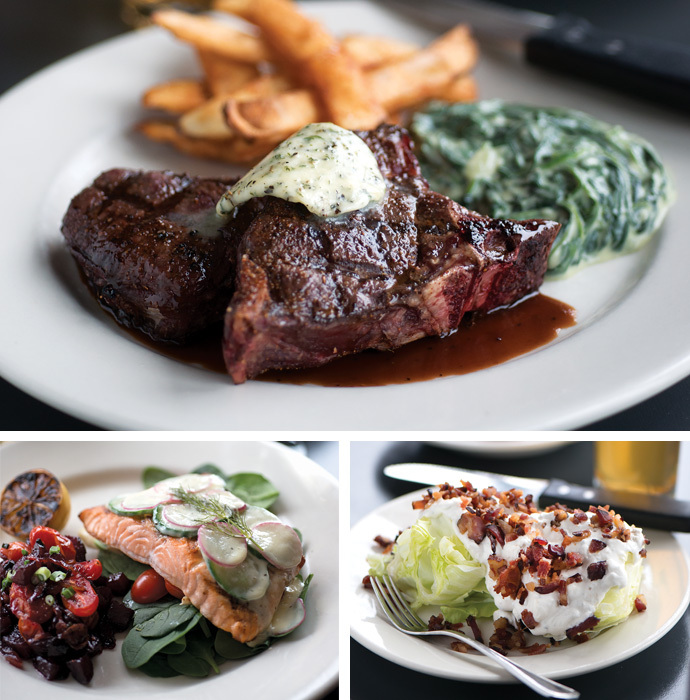 Brahma Grill is a classic American steakhouse fine-tuned to appeal to a broad clientele. The a la carte menu, which Settle developed with head chef Jeremy Yehle, offers two categories of entrées — Dinner, which is a selection of beef and other meat cuts with sides, and Bucatini, which is thick, hollow, spaghetti-like pasta with a choice of preparations. It does, starting with the iconic Parker House rolls served as table bread. They arrived soft and warm, and the salty whipped butter melted into every nook and cranny. 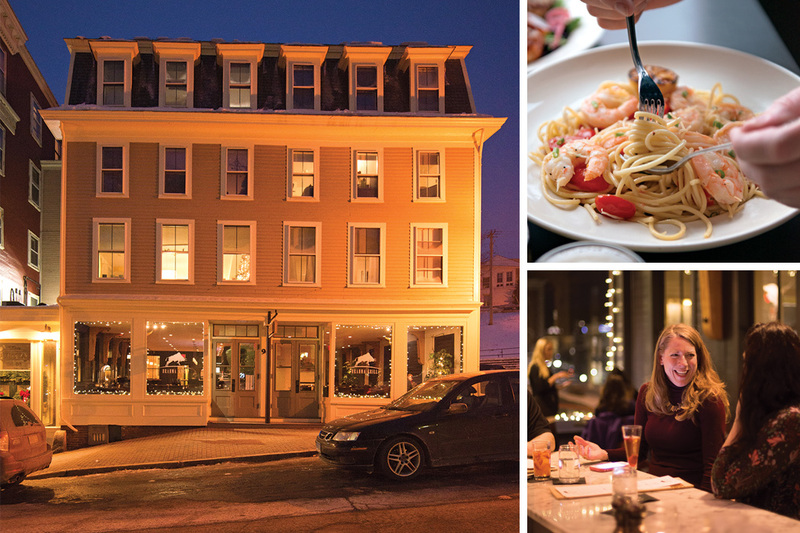 At first glance, the prices on the menu struck me as high for Bangor, but as my meal unfolded, the generous portions and quality of the fare convinced me otherwise. The knowledgeable front-of-house staff promptly fulfilled needs without being overbearing. The table was wiped down between each course and silverware was replaced. The dining room, decorated in dark, muted tones and dominated by large picture windows, was full, a good indication that Brahma Grill is filling a niche. Barbecued wild boar, another starter, is braised for six hours, shredded and burnished with a vibrant, slightly sweet sauce, then decadently piled over toasted baguette and laced throughout with melted cheddar. The simple and delicious wedge salad is a colossal portion of crisp iceberg lettuce, covered in Gorgonzola dressing, showered with crunchy bacon, and served with a steak knife. Iceberg is making a comeback, according to some trendy food magazines, but for anyone who truly loves to eat, it never went away. I opted for shrimp with scampi sauce, which was buttery, garlicky, and served with a wedge of charred lemon to squeeze over the plump shrimp. Because I’m a philistine, I happily accepted grated Parmesan, but I offset this infraction by refusing to twirl my pasta on a spoon. The dish I was most excited about didn’t disappoint: New Zealand elk chops were grilled to a perfect medium rare and garnished with a sprig of aromatic rosemary. The lean meat was so flavorful that I skipped the house-made steak sauce, which is similar to A1 but without the artificial ingredients. The accompanying steak fries were evenly cooked and crispy throughout, thanks to a thinner-than-typical cut. The only fumble was the creamed spinach, which I found too salty to eat. To sip with my dinner, I chose Brahma’s version of a vanilla cream soda, which tasted pleasingly like sparkling Cool Whip. The wine selection is built mostly on recognizable varietals, with a few surprises, like a Galician white blend from the Bierzo region of Spain, while the beer lineup emphasizes Bangor-area producers like Geaghan Brothers and Mason’s Brewing. The whimsically named craft cocktails include The Firestarter (gin, dragon fruit, and a pinch of cayenne) and All My Exes Live in Bangor (Bulldog whiskey, grapefruit, and fresh lemon). Desserts are old-fashioned and unfussy: think strawberry shortcake, pecan pie, and lemon tart. I went for the brownie sundae — few desserts offer more simple pleasure than a hot, slightly chewy brownie topped with vanilla ice cream. Brahma Grill succeeds because it doesn’t show off, instead focusing its energy on preparing approachable, memorable food for a wide range of tastes. And non–Parrot Heads (that’d be Buffet fans) can rest assured they won’t hear “Brahma Fear” on repeat all evening. “The staff is already really, really sick of hearing that song,” Settle says.